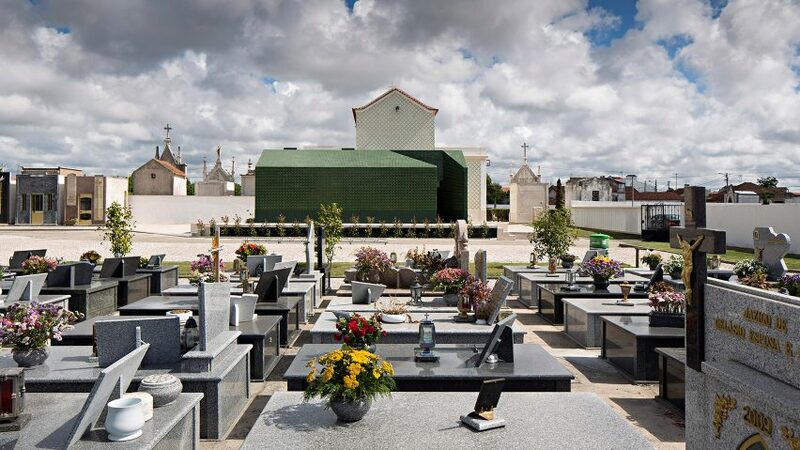 Portuguese architecture studio M2 Senos has completed a new public toilet for a cemetery in the country's Ílhavo municipality, taking the graveyard's verdant grounds and marble headstones as cues for the design. The local practice, which is led by brothers Sofia and Ricardo Senos, was asked by the parish council to overhaul São Salvador cemetery's bathroom facilities on a restricted budget. The clients had found the previous toilets difficult to maintain, and were unhappy that its roof blocked views of the adjacent chapel. "The old building was huge and absolutely out of context," the pair told Dezeen, "[the project] was a kind of exercise to erase the building, and in this process we resorted to an abstract vocabulary." "In general, we don't look for modernity or concern ourselves with tradition, we understand what's wrong and then look for an opposite image." The architects began by reducing the size of the building and giving it a low, angled roof. Its top is punctuated by several skylights which allow light to reach the toilet's interior. Windows have been omitted from the toilet's facade, which is almost entirely clad in forest-green ceramic tiles "to create a uniform and neutral object". M2 Senos chose the hue to echo the strips of greenery and trees dotted throughout the grounds. "The toilet is just something that has to be there, and should be as quiet as possible," explained the team. "The building should be more related to the natural elements, and less with the constructed ones, to highlight the church that is so close by." Deep geometric cutouts at opposing corners of the building form respective entrances for the public and members of cemetery staff. Inside the toilet has been painted white, and fitted with marble washbasins as a visual reference to the headstones outside. There are also showers, and a small room where workers can nap or eat. Other practices have also used unexpected materials in their design of public restrooms – Bureau A added a pink marble urinal to a car park in Zurich, while Miro Rivera Architects applied pre-rusted steel panels for the walls of a park toilet in Austin, Texas.